4 schwestern geboren Rüeck. That was written on the back of the old photo. 4 sisters born Rüeck. 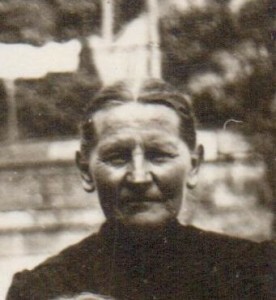 The photo was taken sometime before 1942, the year that Rosine died. 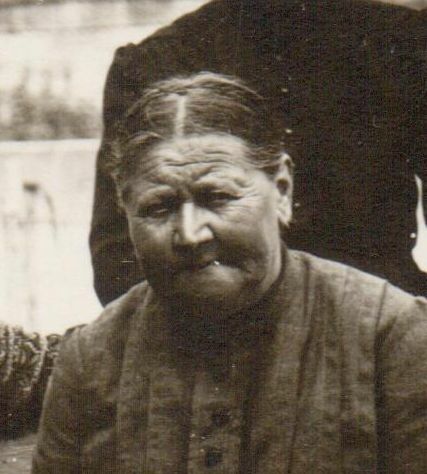 Rosine was the oldest of eight children in the family of four sons and four daughters. The photo was taken in Germany, most likely taken in Appensee or Crailsheim, in Württemberg. As far as I know the four Rüeck sisters never left Germany, although some of their family immigrated to America in the late 1800s. 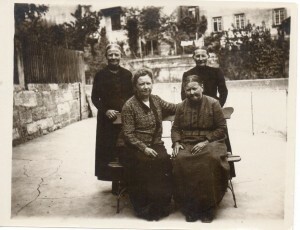 Left to right, front: Barbara, Rosine; back: Margarete, Regina. This Rüeck photo was among some photos my Aunt Em had. Fortunately someone wrote the names of the four sisters on the back of the photo. Last year my distant German cousin Friedemann Mayer contacted me and shared information about some of our Rüeck ancestors. Friedemann is a teacher in Crailsheim and even has some distant Rüeck relatives as his pupils. Barbara (Rüeck) Leiberich (1867-1956), seated on the left, was Friedemann’s great-grandmother. Barbara was the relative my dad visited in Germany immediately after WWII, encouraged to do so by his grandmother Christene. Unfortunately, Barbara’s home in Crailsheim was completely destroyed during WWII. Rosine (Rüeck) Hoffman (1856-1942), seated on the right, married Jacob Hoffman, a farmer in Appensee. According to Friedemann their farm house still stands. Rosine, died in 1942, at the age of 86. She was the oldest of the eight children born to Johann Georg and Marie Margarette (Gross) Rüeck. Margarete (Rüeck) Frank (1860-1944), standing on the left. She married Friedrich Frank and they had the “Schimmelhof” in Appensee, which they later sold. Friedemann explained that the old farm houses in Germany had house names. He said “Schimmel” means white horse and “hof” is a farm. Regina (Rüeck) Gross (1866-1948), standing on the right, married Johannes Gross, a farmer in Zollhof. Zollhof is a small village near Appensee and, according to Friedemann, their farm still remains in the family. The father of the four sisters was Johann Georg Rüeck (1820-1905), the older brother of my great-great-grandfather Jacob Rüeck (1828-1918). Jacob was the father of my great-grandmother Christena (1858-1945), who married Jacob Miller in 1882. Jacob and Christena were the parents of my grandfather Carl Miller. Jacob Rüeck and his family immigrated to America in about 1880. His nephews [and brothers of the four sisters] Johann “Georg” Rüeck (1858-1944) and Jacob Rüeck (1869-1941), immigrated to America as well. 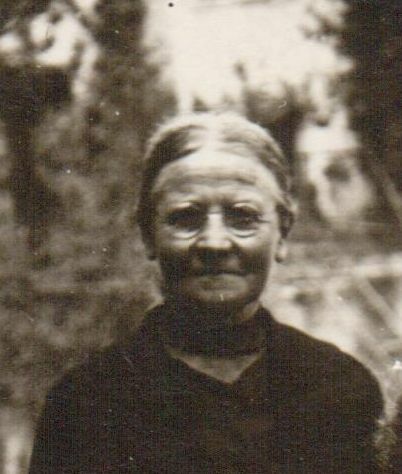 Most of the Rüecks in America eventually moved out west, but my great-grandmother Christena remained in Ohio. 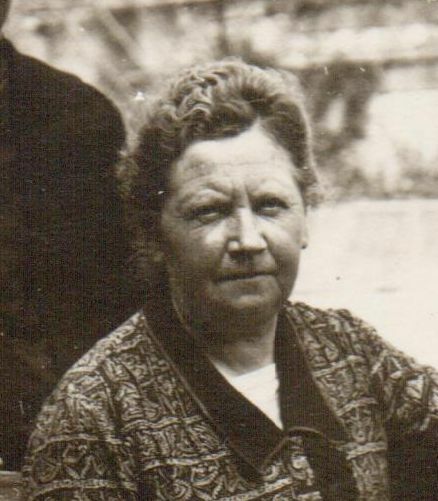 Rosine and my great-grandmother Christena Rüeck were about the same age and they grew up together in Württemberg. The cousins stayed in touch through the years by writing and sending letters across the ocean. Christena (Rüeck) Miller and the four Rüeck sisters were first cousins. Since I am three generations removed from my great-grandmother Christena, the four Rüeck sisters are my first cousins three times removed. Our common ancestors are Georg Rüeck (1787-1870) and his wife Rosina Barbara Lober (1795-1866), who were their grandparents as well as my third great-grandparents. I noticed that Friedemann spells the surname as Rüeck, so I spelled it that way in this post. The American spelling of Rüeck would be Rueeck. [ü = ue in English] I am not sure how they actually pronounce the name in Germany, but in our family I have always heard the name pronounced Reeck [long e]. In Germany they might pronounce it as Rue-eeck’. What a wonderful photo! It is always nice when you can visualize and identify distant family members and put a face to a name. This makes family history come to life! The sisters and my grandmother seemed so old but they all were still living in my lifetime. I must be getting older too. Apparently members of the Rueck family still live in Oregon and Washington. Family history indicates that Michael Kallenberger and his wife Margaret (Margaretha) Rueck Miller (before marrying Michael) visited them in Oregon as a “honeymoon” trip taken some time after they were first married. My brother claims to have met a family member and found grave markers at a church near where he now lives in that area. Of course part of the issue is the changing of the name to Amercianize it, so that even family members have lost grasp of the correct or connected spellings as you have noted so clearly.